Spending the day riding your ATV over all sorts of challenging terrain is exhilarating. Unfortunately, the downside is that you and your ATV often come home looking as if you’ve been mud wrestling! I’ll admit that cleaning an ATV doesn’t rank as number one on my list of fun things to do. But keeping your four-wheeler clean is vital to ATV maintenance. Why Worry about Keeping Your ATV Clean? A good cleaning takes some time, but it’s worth the effort. 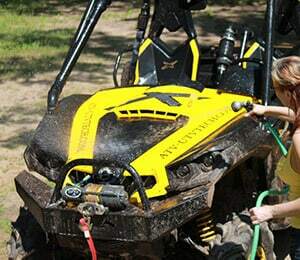 Keeping your ATV clean is the first step in maintenance. Dirt, grease, and grime can speed up the wearing process on the important parts of your ATV: the bearings, seals, chain, and sprockets. Cleaning takes some time. But there are ways to streamline the process. If you follow these tried and true tips you’ll find the job almost enjoyable. Your ATV will thank you! Next, presoak your ATV. Spray the entire machine with a wide nozzle spray. Leave your four-wheeler to soak. After it’s had time to soak, repeat the process using a heavy wide spray. Depending on how dirty your ATV is you might need to soak it three or four times. Now, use a pressure washer on its highest setting to blast all that debris off your ATV. Next, take a sponge and a good automotive detergent. Scrub all of the surfaces of your ATV– especially the plastics, the seat, the frame, the wheels, and tires. If some areas are uneven or hard to reach use a good stiff brush to get dirt and oil out. On very stubborn oily patches like the chain lube where it goes into the swing-arm, use a degreaser. Spray on. Let sit for a few minutes. Scrub and wash off. Allow your ATV to dry. Spray on a silicone polish—especially on the plastic parts. This will make your ATV shine like new. Lubricate and grease the chain, sprockets, and bearings. Riding an ATV is just about the most fun a kid—or kid at heart—can have. But riding an ATV comes with responsibilities. One of these is keeping your ATV clean and in good running order. 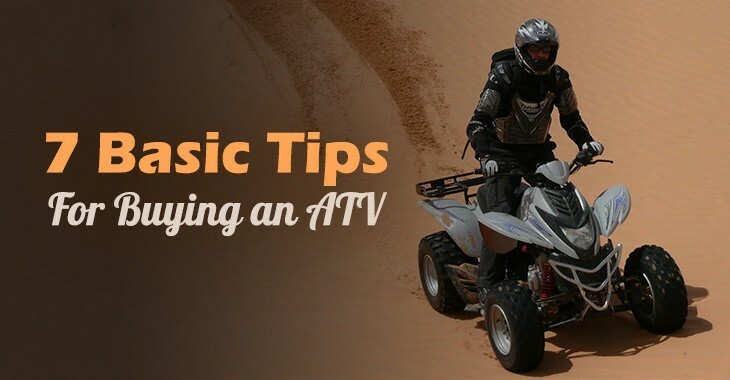 Following the tips I’ve outlined should help you keep your ATV looking and running great! If KidsATVsale.com‘s tips are useful for you we will be grateful for sharing this post.